Repelling deer, rabbits and squirrels. This patented ready-to-use spray repels deer, rabbits and squirrels from flower gardens and plants. OMRI listed® and compliant for use in organic gardening, this is truly the best repellent on the market! Truly the best repellent on the market! The formula of our NEW Deer Off® II contains MORE active ingredients than our original Deer Off® with 4X's more putrescent egg, 1.5Xmore garlic and 1.5X more capsaicin. 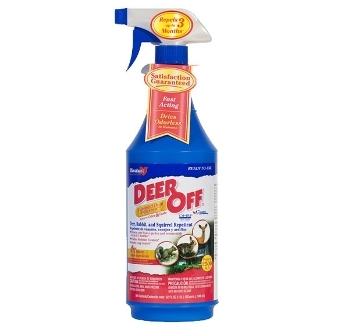 This deer repellent is also ideal for repelling rabbits and squirrels. Havahart® Deer Off® II Deer & Squirrel Repellent has a patented Dual Deterrent System™ formula that provides both scent and taste barriers to repel deer, rabbits, and squirrels. The formula contains putrescent eggs solids (4.63%), garlic (.001%) and capsaicin (.001%). The putrescent egg and garlic scent, coupled with a hot pepper taste will dissuade deer, rabbit, and squirrels from eating your plants. If the critter gets past the odor, it'll be repelled by the taste. Deer Off® II Deer & Squirrel Repellent is made from natural and food based ingredients. OMRI listed® and compliant for use in organic gardening, this product is also EPA registered for direct use on plants, bulbs, flowers and trees. Deer Off® from Havahart® - the recognized brand leader in nuisance animal control.